Due to concerns this year after an overbooked outing, Art on the Farm concluded this year's farm visits after May 28th. Although we are delighted to have so many artists that wish to participate, we must cooperate and communicate better with the farmers as guests on their land. We will regroup soon to plan our next exhibit, fundraiser, and next year's outings. Our apologies to any artists and farms affected. Please continue to follow marinorganic.org to glean at farms and attend paid events to support organic farming and field studies in Marin. Art on the Farm is highly active on Twitter, sharing Organic Food, Farm Art, tips and local producer info. 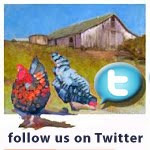 Follow us @ArtontheFarm on Twiiter to stay connected. Thank you.